The piano works by Isaac Albeníz range from indisputable masterpieces to ravishing salon music, the composer painting with bright Spanish colours as well as the hues of Classicism or Romanticism. 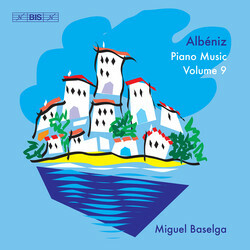 On eight previous volumes, Miguel Baselga has guided listeners through the music of his compatriot, earning acclaim from reviewers worldwide: ‘pianism of the highest order’ (MusicWeb-International); ‘berauschend agil und rhytmisch spannungsgeladen’ (PIANONews); ‘un pianista elegante y refinado’ (CD Compact). With the assistance of Albeníz scholar Jacinto Torres, Baselga has been able to access rare editions and scores, and his exhaustive series includes the Marcha militar by a nine-year-old Albeníz (Vol. 7), as well as the four books that make up the celebrated Iberia (Vols. 1-4) and the composer's only two scores for piano and orchestra (Vol. 6). On the present disc Baselga offers us the chance to hear the last of the three Improvisations, transcribed from a phonograph recording made by Albeníz in 1903. A large part of the programme is from the late 1880s, however, a period during which the composer was a fixture at the fashionable salons of Madrid, and composed works in which the influence of composers such as Mendelssohn, Schumann and Chopin is often evident. Recuerdos de viaje, one of the best-known works from the period, nevertheless displays the Spanish flavours that were to become one of the distinguishing features of the music of Isaac Albeníz.